Each one of our HOST INSTITUTE receives one complimentary hand designed poster for marketing purposes. Tell us the journey your shoes have been on. 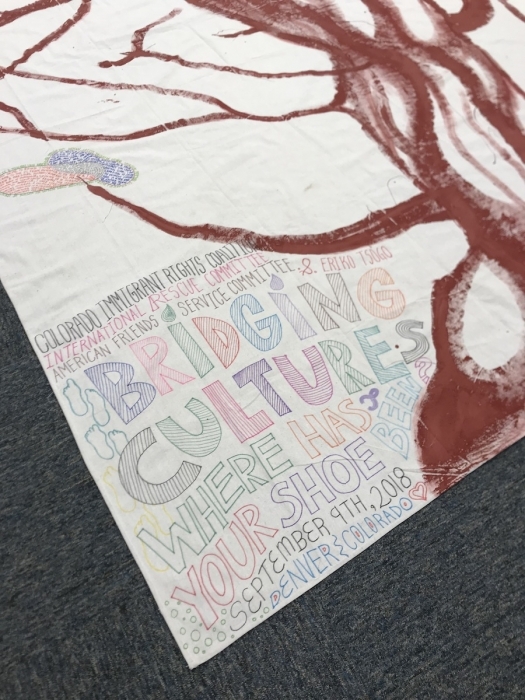 Bridging Cultures: Where has your shoe been is a civic engagement based community nomadic art project by artist Eriko Tsogo in collaboration with Colorado Immigrant Rights Coalition. The workshop runs one day and uses the power of storytelling, art, writing, performance and community to bring and bridge cultures together. An old American proverb recalls, "you can't understand someone until you've walked a mile in their shoes." 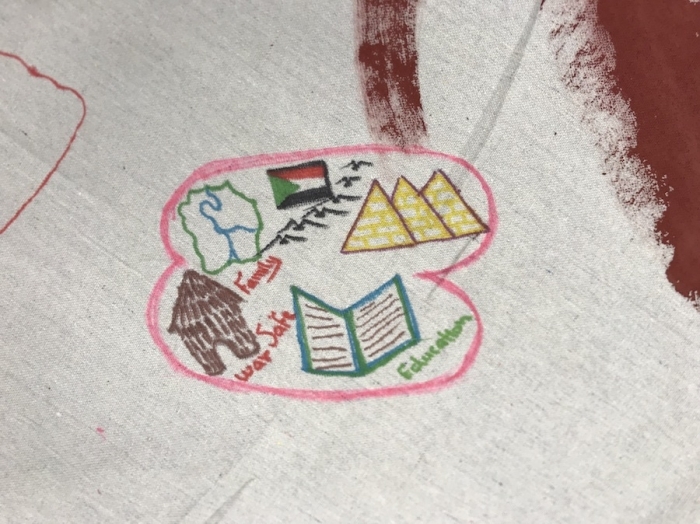 In this spirit, we invite you to come create a community art project using the power of storytelling, art, and writing to bridge cultures and bring different communities together to learn from one another. 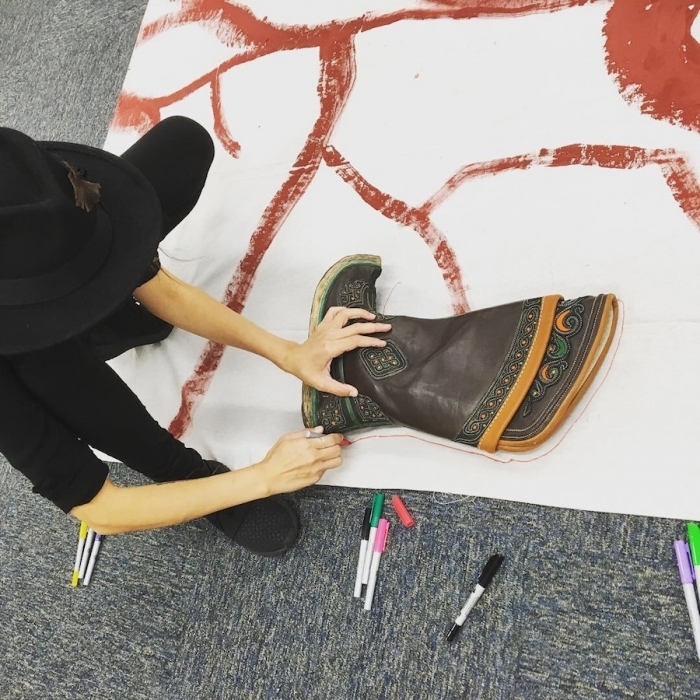 In order to participate, participants can bring a shoe from their culture or any favorite shoe or they can use the shoe they are wearing and/or illustrate their traditional/cultural shoe or a shoe that has significance to them. Afterwards, the community art project will be available for display and photo ops. Help spread the word about our project on social media! - Workshop runs ONE DAY spanning anywhere from minimum 4-8 hours depending on size of expected attendee group. All details to be discussed with Host Collaborator/Institute. - Workshop open and free to everyone and every age but RSVP required ahead of time, children under 12 please be accompanied by adult. - MANDATORY: Interested participants please bring atleast ONE or more traditional shoe from your culture. Optionally, participants who do not bring a shoe can use the shoe they are wearing on the day of workshop or even trace their barefoot. - All workshop terms are flexible and can change to better accommodate the Host Collaborator/Institute’s preferences. I will start by introducing myself and the workshop. 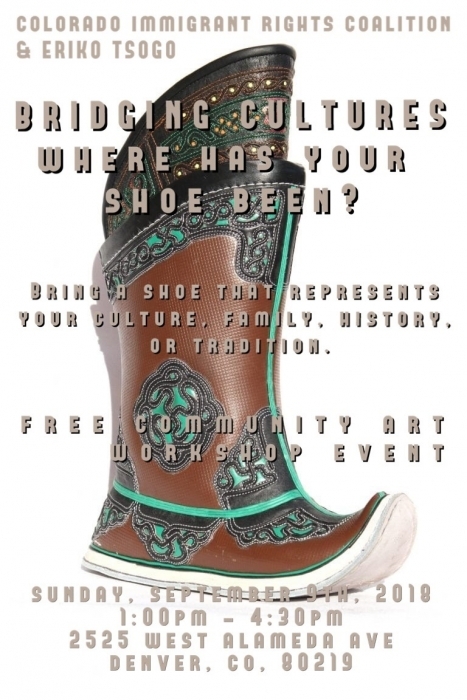 I will rent a few different pairs of traditional Mongolian shoes from the Mongolian Culture and Heritage Center to use as demo and share the story behind the Mongolian boots. 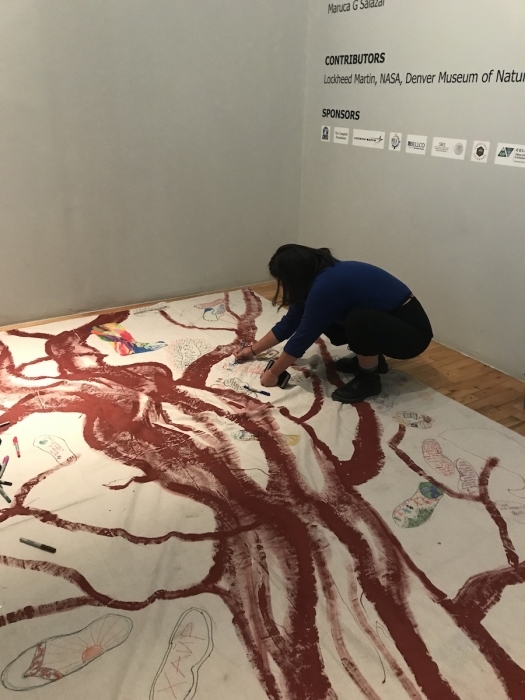 I will do a live art "shoe tracing demo" on the main “tree of life canvas” placed on the floor. If enough people have arrived by the start of the workshop, we will get into a circular formation and the rest of the group can continue to introduce themselves/share their cultural shoes with the group until everyone has shared their story around the circle. If people are slowly trickling in at the start of the workshop, I will start with the demo then participants can get right into the workshop skipping the sharing stories until the end. 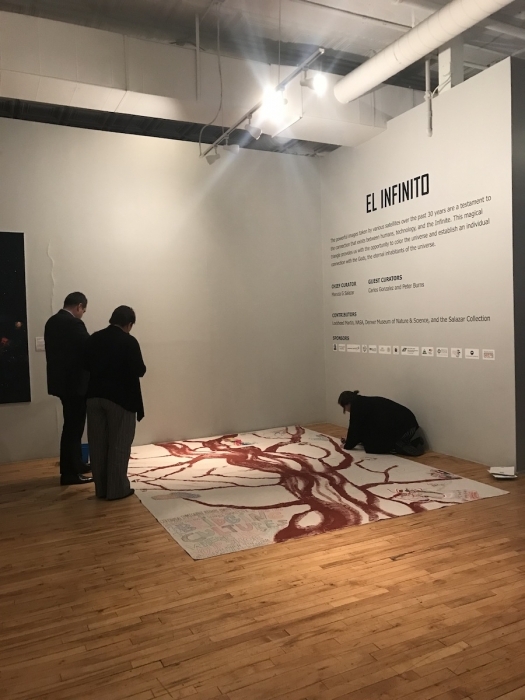 The main canvas on the floor has the "tree of life" and branches outlined in paint. Each shoe imprint represents a leaf. 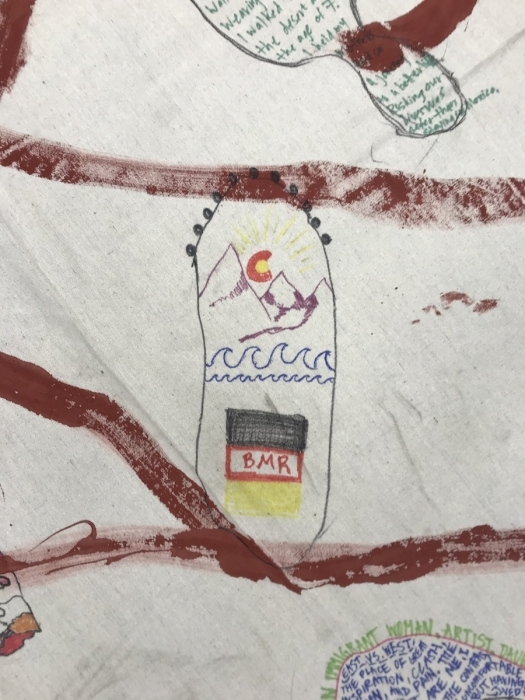 Using the provided art supplies (permanent markers), participants can trace their shoe(s)/sole however many times and wherever they would like throughout the canvas. 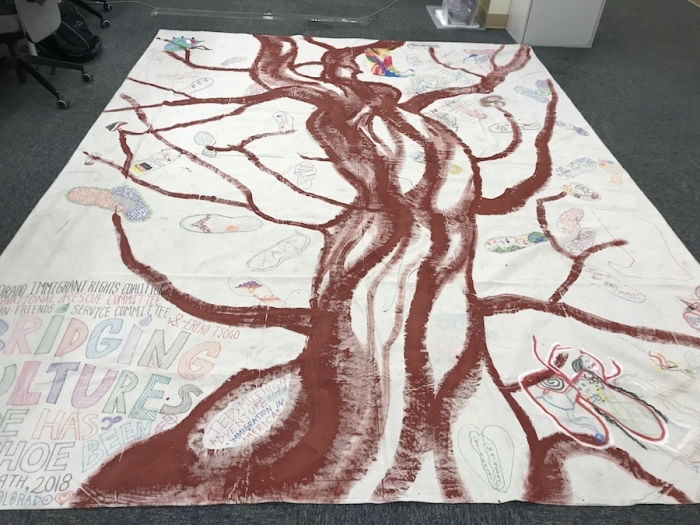 The end goal is to fully populate the canvas with shoe imprint leafs, until our tree of life has grown into a fully-grown lush tree. 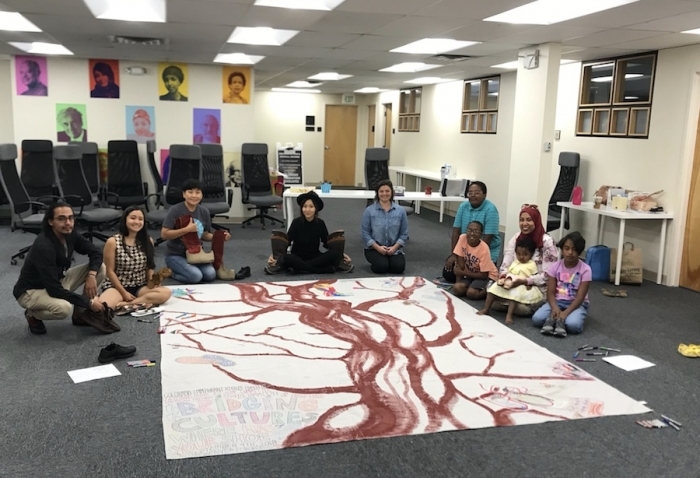 Once the Tree is complete, the Bridging Cultures canvas will be permanently exhibited at a local TBD venue. "Where has your shoe been?" 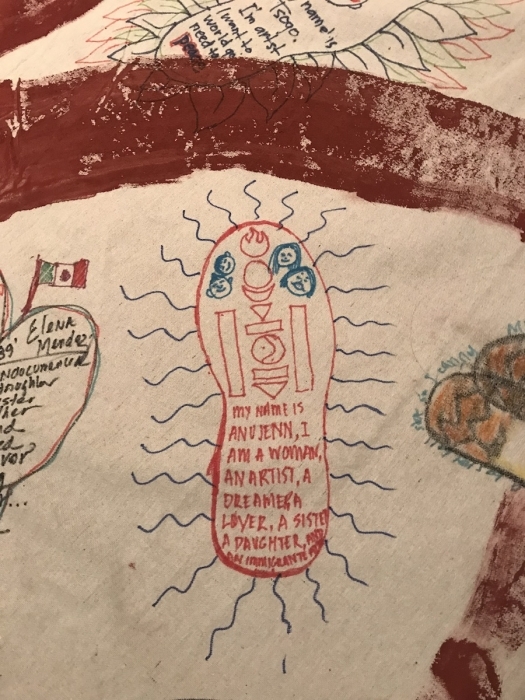 "What is your immigration story?" "If you could walk a mile in someone's shoe, who would it be and why?" "What does your cultural or traditional shoe look like?" "If you were a shoe, what kind of shoe would you be and why? Optional: We welcome participants to leave our workshop with a Polaroid photo memorabilia. Make sure to stop by the photo area and get a free Polaroid picture with your shoe! Or with a Mongolian boot! 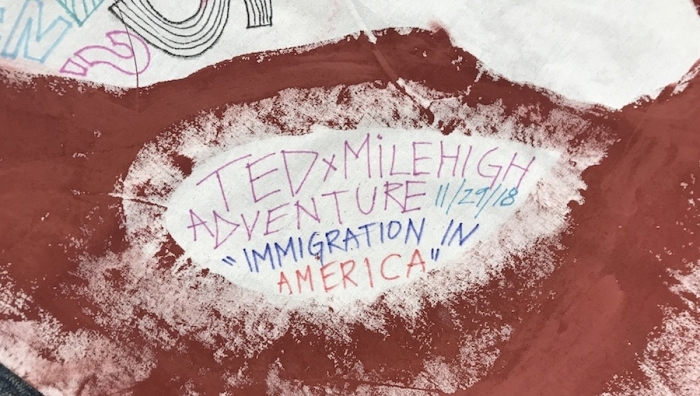 - The second stop was at TEDxMileHigh Adventure "Immigration In America" event on Thursday, November 29th, 2018 at the Museo De Las Americas. - The third stop will be at University of Denver in April of 2019. 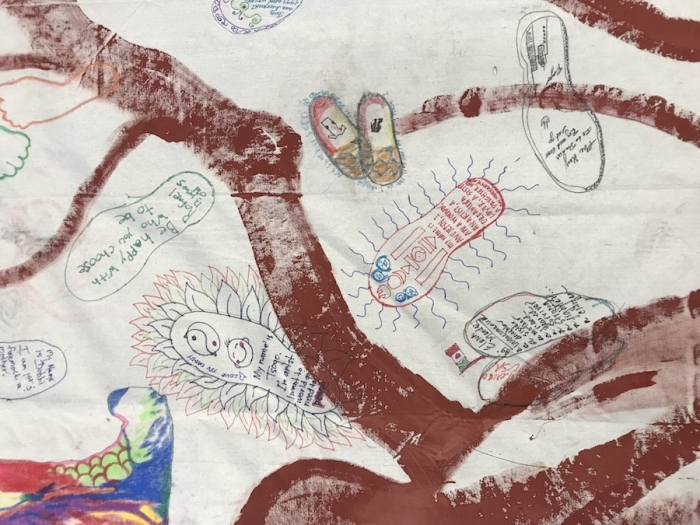 We permanently commemorate all of our Host Collaborators on our Tree of Life canvas. Interested in becoming our next HOST INSTITUTE? Please help keep the Bridging Cultures project alive and become our next HOST INSTITUTE. We welcome collaboration with immigrant, refugee, pro diversity student groups. 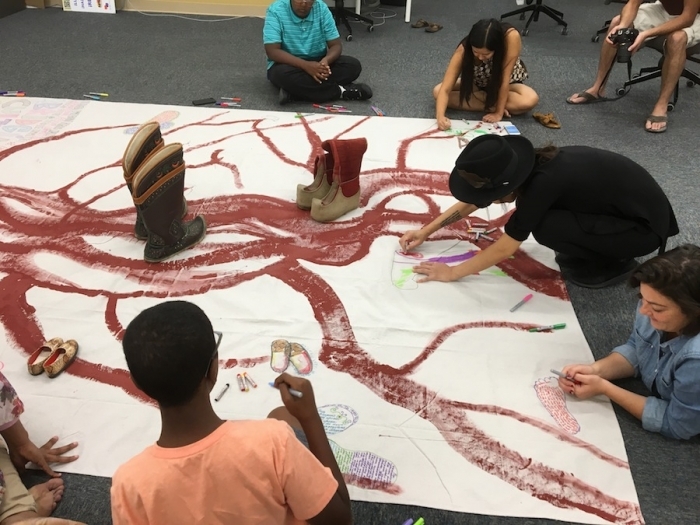 The Bridging Cultures socially engaged art workshop uses the motif of a shoe to promote inter-cultural exchange, integration and advocacy through personal storytelling. The project is designed to implement social and cultural diversity in its entire context, therefore the greater and mass diverse populous of participants, the better. 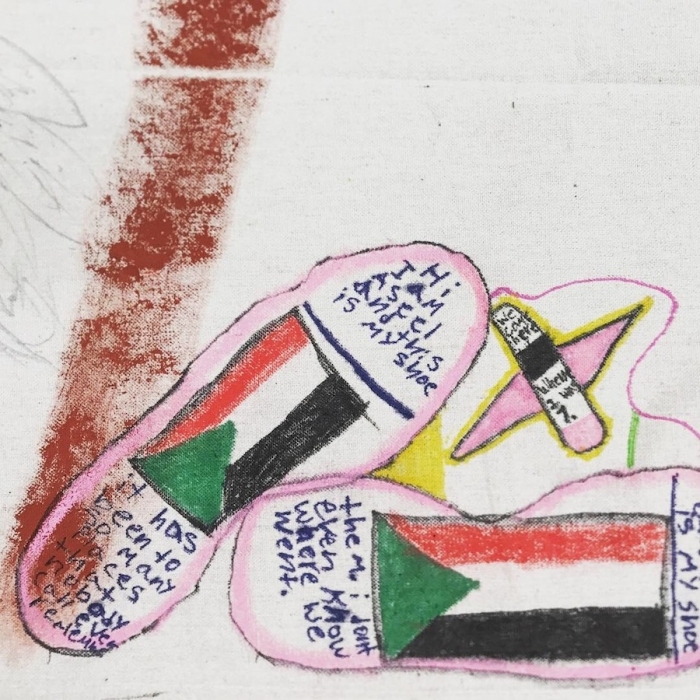 The shoe motif provides a unique way of artistic dialogue between different cultural communities to empathize with one another in order to understand and learn from each through our differences, celebrating diversity and advocate social change through innate creativity. The Bridging Cultures Shoe workshop continues to receive great reception, participation and feedback from all the participants, organizations and communities who have had the opportunity to partake in the unique social art experience. 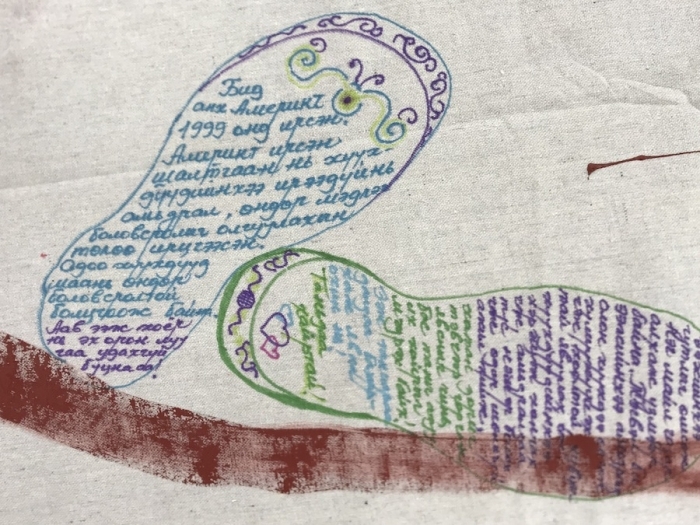 All of our Host Collaborators are permanently commemorated on our Tree of Life canvas. The entire workshop is setup and completed on the floor. The Tree of Life canvas measures 9ft X 14ft and will be placed on the floor. Hard ground surface is recommended, no preference between indoor or outdoor environments. May need additional chairs to help accommodate participants with mobile disability. Please contact erdensyren@yahoo.com regarding budget specifications.